Last weekend Ewan and I ran his first race, the Storybook 5k. 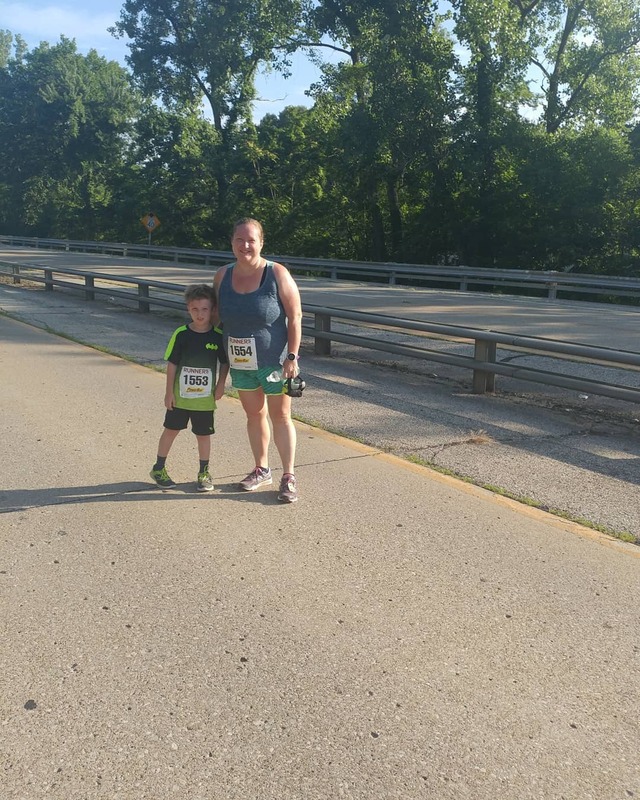 It was a race geared toward families and we did it with a friend of mine and her son. Ewan ran a mile in gym class this past year and ever since he's been asking to do a race with me where he gets to wear a number. So when I saw this, I knew it was perfect. We all started out together but very quickly my friend's son and Ewan took off. I could see them ahead of us and we had both told them to make sure they get water at the water stops so we were hoping they did. I had been doing a run/walk with my friend but around 1.5 miles I saw Ewan standing off to the side with a water bottle. I ran up to him and made sure he was ok, but I knew he was probably done at that point. I told my friend to go ahead and I would see her at the finish. It was SO HOT already at 7AM and even though I told him to make sure to get water, he didn't stop. While I knew we would be walking most of the race, I was concerned about him getting heat stroke so we leisurely walked the rest of the race. Except for when we could see the finish. I told him he could run ahead of me to the finish and that he did. I was pushing it to keep up with him. The girl taking photos at the end said he was going so fast that she wasn't able to get his picture. Alan jokes that that was the beginning and end of his running career, but I hope he decides to do another race with me sometime. I'm so proud of him for getting out there and doing it!